Superior, nourishing, tinting and waterproof cream for footwear. Notes: An old formula. Though it is a cream containing water, a percentage of fundamental solvents always remains for the in-depth transfer of the waxes and pigments into the leather. Historical virtually unfindable waxes. This product is also available in neutral and brown. 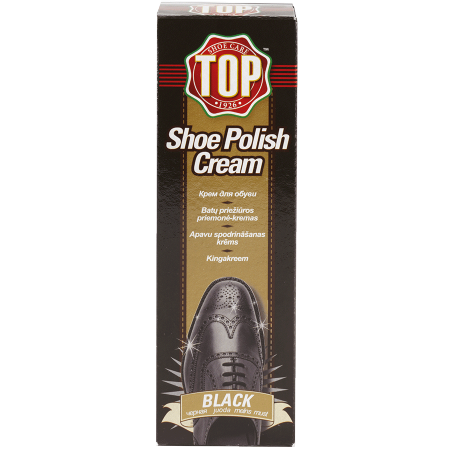 Remove any dirt, apply a small quantity of Superior Footwear Cream on the brush or polish applicator, and then apply it evenly on the shoe leather. Leave to rest for a few minutes and then rub energetically with a cloth, preferably woollen. Repeat the operation several times a week in order to have shoes that are always nourished, protected and polished. Smooth or polished or "closed grain" leather, glazed, brushed, printed, eco leather. Leather other than the indicated colour, suede, nubuck, synthetic velvet, alcantara, peccary, patent leather. Thanks to its complex formulation based on vegetable waxes (including the precious Carnauba and Montana ones), pigments and silicone, this cream provides shoes with the maximum nutrition, protection, colour and insuperable brilliance. Moderate waterproofing power.